This morning I was praying while I was walking the dogs and my eyes kept drifting over to a newly mowed field in the subdivision where we usually walk. For the first time I noticed that this particular field had quite a bit of clover in it. I’d never noticed it there before since the grass was so much taller than the clover. Usually I keep the dogs out of tall grass when we are walking since they always seem to find something wet or nasty to rub up against in the high weeds, but since someone had come by and mowed the field last evening I figured that I’d let the dogs explore a bit. Knowing that this was the command that I used when I wanted them to leave me alone both of the dogs stepped away and went on with their quest for new and intriguing scents while I went back to looking though the clover. 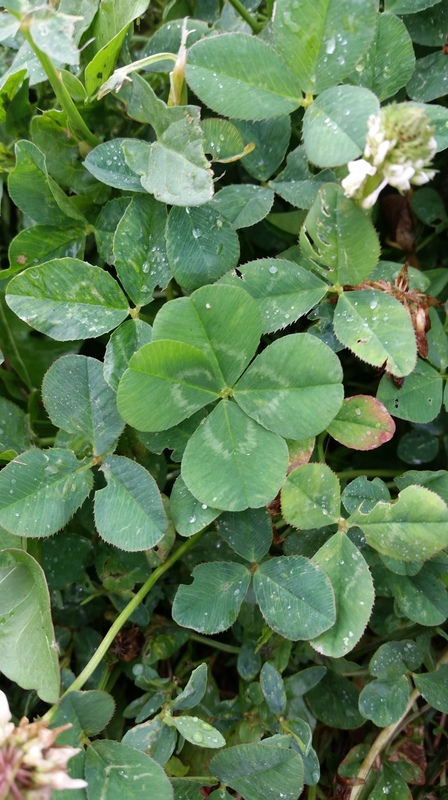 My thoughts immediately drifted to thinking about my prayers over the last few weeks about finding a four-leafed clover. Almost immediately I began to be assailed by an attack of negative thoughts from the enemy. Feelings of being foolish washed over me; feelings that I wasn’t important enough to keep expecting God to do something as inconsequential as giving me a four-leafed clover. I got up and kept walking the dogs, but my thoughts became more and more negative as I walked down that road and pondered in my mind what I was really asking for. Thankfully those thoughts had an almost oily, slimy feeling that instantly helped me recognize that they weren’t my own worries and fears but were those coming from a more inimical source. Realizing that I was being attacked I closed my eyes and prayed to God saying, “Father, I know that You are a great and awesome God and I know that no request from one of Your children is too small a favor to ask. Lord, I have confidence that You will give me a four-leafed clover one day; maybe not today; maybe not tomorrow; but in Your time.” As soon as I stopped praying I opened me eyes and I felt drawn to my left. There in front of me was a small clump of clover that I had barely been able to see from the road. When I knelt down in front of this patch of clover there in the middle of it was a four-leafed clover! Once again Jahovah-Jireh proved Himself to be the God who Provides. Just as God provided a ram to be a substitute for Isaac He still meets all our needs; even those that we might think are too small and inconsequential to bother him with. This entry was posted in On The Road and tagged Answers, dogs, Four-Leafed Clover, God, Jehovah-Jireh, Prayers, The God Who Provides. Bookmark the permalink. on TV, so I just use web for that purpose, and obtain the newest information.